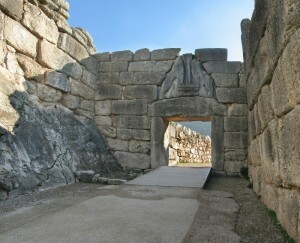 Erected in 13th century Mycenae in southern Greece, also known as the Bronze Age, Lion Gate is one of the only surviving examples of monumental Aegean sculpture. 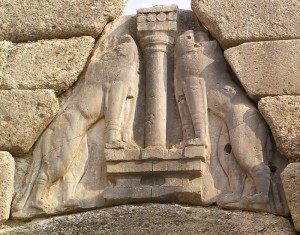 It features two lionesses carved on a triangular piece of stone above the lintel. In Mycenaean architecture, it was common to use a triangular stone as a “relief stone” that the irregularly shaped blocks of the parallel walls could rest on. This particular relief stone is engraved with two lionesses posing on a pillar. In ancient architecture, lions symbolize both protection and divine right. Due to Lion Gate‘s near proximity to the Mycenaen palace and a site known as “Grave Circle,” scholars believe that the lionesses were guarding royal grounds. Lion Gate also served as the entrance to the citadel. It was made just before the downfall of the Mycenaean empire, representing its short but powerful rule. To those in the industry, architecture like Lion Gate is inspirational. We love seeing pieces of art that stand the test of time and tell a story long after its creators are gone. This entry was posted in News on March 14, 2014 by Boom Visibility.